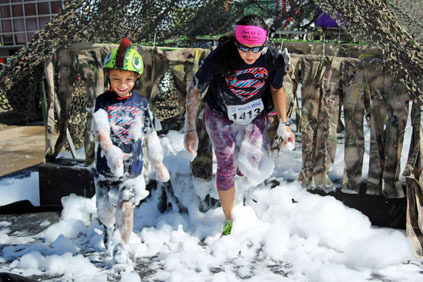 Above, participants in Saturday’s Wet ‘n Wild Tour, hosted by Ride for Bikes, emerge from a particularly sudsy obstacle during the annual event, in which walkers, runners, bikers and skaters make their way along a four-mile course punctuated by Soaker Stations, manned by Soaker Teams sponsored by area fire departments and businesses. All proceeds from the Tour benefit Ride for Bikes’ annual Christmas Bike Program and the Ride to Meet the Challenge Scholarship Fund. 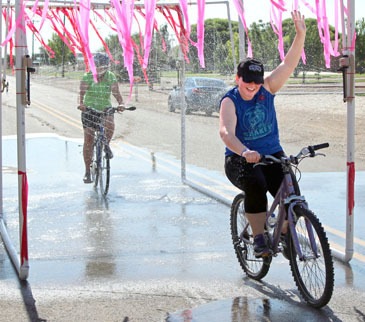 Below, a woman rides her bike through Dynamic Heating & Cooling’s water station.